In my first sharing on the NEmation!6 Production Phase, my focus was on The Unsung Heroes. In my second post today, I’ll be shifting my focus back to the main actors and actresses … yes, you got it … the Top 10 Teams of NEmation! 6 and their production progress. In the production phase of NEmation! 6, every team goes through three weeks of animation production with some variations depending on the animation techniques that was chosen for their production. Some of the animation technique will require them to trace or paint or do some clay modeling or do paper cutting while some will draw digitally. But whatever the chosen method, it’s not an easy task to produce an animation that’s fit for nation-wide broadcast or even submission for international animation competition … even if it’s just one minute long. Ambassador’s Note : I was told that a one-minute animation could cost up to a million dollars to produce commercially. Teams using this technique includes : Dreamation, Hungry Monster, Reveille. For teams doing rotoscoping, they were provided with a film clip, produced based on their storyboard, for them work on. Every team will trace their frame using a slightly different method depending on the look and feel that they were trying to achieve. 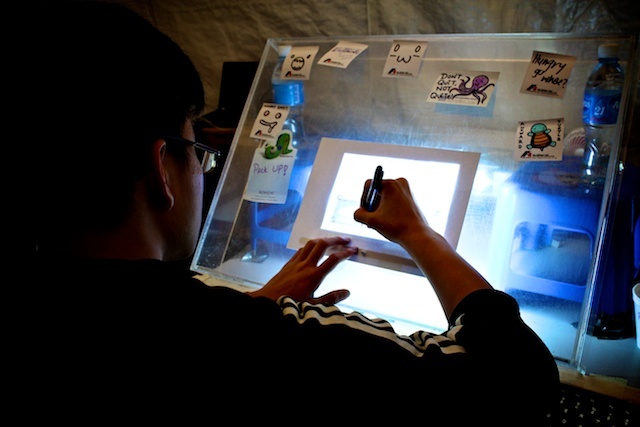 Team Hungry Monster trace their frames using pen and paper on a lightbox projection. After speaking to all three teams doing rotoscoping … the challenge that they face seems to be … well … drawing!! More accurately, it’s about the mammoth task of drawing 24 x 60 frames … which is about 1440 frames. That’s not counting all the redrawing that they had to do (when they draw/trace wrongly or the animation sequence don’t turn up satisfactorily). The redrawing problem was more pronounced for Hungry Monster who draws with pen and paper. There was this one scene which they had to redraw up to 5 times just to get it right. Ambassador’s Note: A scene could be a couple of seconds long and each second has 24 frames … so it’s a lot of work. For Dreamation and Reveille, they too have to redraw digitally but at least they can erase digitally. The challenge for them is that they need to Animate a Sense of Movement in their drawing by changing the outline slightly. It takes experience to do draw that sense of movement. Too much and it will look awkward. Too little and there will be no perceivable movement. Team Reveille's Drawing ... Do You Get A Sense Of Movement? The last challenge they had was a surprise to me … it’s Boredom. Why? Well … because what they have to do mostly for the whole production period was … Draw, Draw, Draw, Draw, Draw … get the idea? Yeah, I will get bored too! Each team doing Rotoscoping spends about 11 hours daily during the first 2 weeks just drawing hundreds of frames and they will likely spend the same amount of time during the last week drawing the rest of the hundreds of frames and touching up on those completed scenes. Ambassador’s Note : Drawing 12 hours a day for 3 weeks? I can’t really imagine that. Tracing is ok but still very very tough for folks like me who only type. So well done for making it so far! Teams using this technique includes : Viva, FERD, Jelvetica, EatYouUp, Asian Keedz and S.S.S.A. For teams doing stop motion animation, they will have a pre-production phase to create their objects or models and backgrounds of each scene first with either Clay, Paper Cutouts, 2D Animations or Paintings. Corrections : Team EatYouUp has informed me that their technique should be a mixed of creating props, backgrounds, character traditionally, capture them and animate them using Toon Boom 6 (Digital 2D Animation). So the pre-production process is the same as what I’ve written but they don’t face the challenge of getting the motion right. Based on this correction … I think Team FERD and Team Viva might be using this mixed technique too!. Team Viva With Their Classic Paper Cut Outs ... Cute Or Not? From what I gather, the challenge for the Teams choosing Stop Motion as their animation technique is in two area. First, it’s Getting the Models, Objects and Scenes Right. When I say getting it right … I mean the shape, size, look and especially the colour. The colour has to be just right, not just the right shade of colour but the colour has to be uniformly applied. Why? If you don’t apply the paint evenly, it will show up when it is being animated … the blotches of uneven colour will “flicker” during the animation and distracts the viewer. Team EatYouUp told me they had to reshoot about 200 frames after their “flickering” animation failed Quality Control. Ouch! Ambassador Note : Quality Control comes in the form of Instructor reviewing the work and pointing out the flaws in the animated sequence. The Is A Sample That Passed Quality Control ... Looks Professionally Done Right? Next, they have to be careful not to bend or leave marks on their cut outs which may cast shadows when the stop motion is being captured. As before, the “flicker” of shadows will distract viewers watching the animation and should be avoided. This Sample Is Provided By FRED ... Can You See The Bends? Can't See The Bends? Let Me Magnify Them ... Can You See Them Now? 2 Bends ... one left and one right. That’s the sort of Quality Control each team goes through … they are expected to produce materials as close to professional standards as possible. Next, it’s Getting The Motion Right. Getting those small increments between frames right isn’t as easy as it sounds … that’s what the teams doing classical Stop Motion found out (Team Jelvetica and Asian Keedz). Animating a scene where someone runs from the left of the frame to the right can take up to half a day if you can’t figure out the right position from frame to frame … it’s that time consuming. Some Teams such as Team EatYouUp, FERD and Viva use an animating software called Toon Boom to capture each layer of their models, objects and scene then tap on the software’s function to animate motion by moving parts (such as arms, legs, bodies, etc) around. Team S.S.S.A used Stop Motion Pro (yet another software) to complement their Claymation. Ambassador’s Note: Different Software were used for different team to maximised the efficiency in the production and no team was put at a disadvantage due to the software used. To enable the use of software ability to animate motion requires an object to be broken down into it’s moving parts and hence increases their complexity. Each team doing Stop Motion spends about 11 – 12 hours daily for about 8 working days creating their models. Followed by 12- 13 hours daily (sometimes even more) when the actual animation production starts. I have a feeling that they would probably spend the same 12 – 13 hours during the last week of production either catching up to schedule or to achieve a smooth animation. Ambassador’s Note : I always enjoy watching the groups doing clays, painting and cutting their props. The props they create are always so adorable. And I can’t help but smile when I see them trying their hands at animating motion. Yes, I see them struggle but I also see a stubborn refusal to surrender and an attitude to push on and finish the job. There is just one Team doing Digital 2D animation … Team iSmacked! Team iSmacked was the only Team that had a dramatic event during the first week of NEmation! 6 production as they had to change their animation technique 3 days into the first week of production and switched to 2D animation using Toon Boom. With 3 days lost, there was a lot of catching up to do but they solved it with nothing more than a weekend of extra work. Amazing! So will it be smooth sailing into week two now since they have Toon Boom’s software strength in creating smooth motion and no uneven painting to worry about as the colouring is done digitally. Unfortunately not … Team iSmacked told me that synchronizing the animation to the beat of the music was hard (they are doing an animation to the tune of a RAP). The reason for that was that software cannot slice the music into 24 parts per second to allow them pin point accuracy in synchronizing movements to the music beat. In fact, they couldn’t get any form of assistance in the music department from the software at all. All they could do was to estimate when the next beat was and animate the motion to that point of time and playback the work to see if everything gels. If it’s in sync … GREAT! If not … REDO! Team iSmacked spends about 11 – 12 hours daily but the last I checked with them … they were already back on schedule despite losing 3 days of work. Ambassador’s Note : What can I say more … it would have been extremely demoralizing to realize that you need to restart after working 3 days into the production (that’s 20% of production schedule) … but they recovered and caught up with the schedule by the end of week Two. Well Done Indeed! As you probably have felt (reading this) by now … animation is not an easy job … it’s tedious, time consuming, it requires lots of patience … which means it’s tough. Those are facts that all Top 10 Teams already knew about before coming to the production phase of NEmation! In that 2 weeks getting their hands dirty (literally for many of them … doing the paintings and clay making) … they’ve found out what it takes to be a real animator … and more importantly, if they have what it takes. Just as a comparison, Pixar Animators spent a week per 8 seconds of animation for Woody (the cowboy character from Toy Story). So they would have only completed 24 seconds in Three weeks and each of the top 10 Teams completed 60 seconds in the same amount of time. Ambassador’s Note: To be fair to Pixar, Woody was much more complicated (Woody required 723 motion controls, including 212 for his face and 58 for his mouth – Wikipedia). Another reason why it’s so tough is due to the level of Quality demanded of the Top 10 Teams even though most of them are new to animation (most of them have less than 8 hours of animation experience). As one Instructor told me … they treat all 10 Teams are their partners in the production of the 60 seconds clip and expect them to carry out the production at the same level as what they (the instructors) would do themselves. It’s Tough but ensuring high standards is how you get trained to become really good at what you are doing – especially for animators. In fact, the Quality of production is so high that the completed work can be used as the students portfolio to gain entry into relevant courses – such as a Diploma in Digital Media Design (Animation) at Nanyang Polytechnic. So for all your achievements in the past 2 weeks … Do pat yourself and each other on the back for soldiering on when the going gets tough!! WELL DONE!! Note1 : All Photos Taken With Canon EOS 600D. Note2: All Works Were Taken In Week 1 and Week 2 of NEmation! 6 Production. Note3: I Know Many Of You Are Waiting For That Special Edition … It’s Coming Soon … So Watch Out For It! This entry was posted in James Soh, NE6 Ambassadors and tagged Animation, Canon, digital 2D, NE6, NEmation Ambassador, rotoscoping, stop motion. Bookmark the permalink.